Today is the winter solstice, which also makes it the eighth anniversary of this blog. I like to mark these astronomical occasions with posts about archaeoastronomy, which is one of the most interesting fields of study relating to Chaco Canyon and other prehistoric sites of the Southwest. Today I just have a brief and fairly speculative post connecting some other suggestions I’ve made about how astronomy related to the larger cultural systems of these societies. From what little we do know, the towers and related sites seem to be post-Chaco in age, and they don’t show much evidence of Chacoan influence. Williamson mentions tree-ring dates at Hovenweep Castle, the largest tower site in the Little Ruin Canyon/Square Tower group near the monument’s visitor center, of AD 1166 and 1277, which is after the main florescence of Chaco and contemporary with the cliff dwellings at Mesa Verde. The towers do have some architectural similarities to the cliff dwellings, and overall seem to fit into the Mesa Verde or Northern San Juan tradition. They don’t show any particular resemblance to Chacoan “great houses” in either size or form. 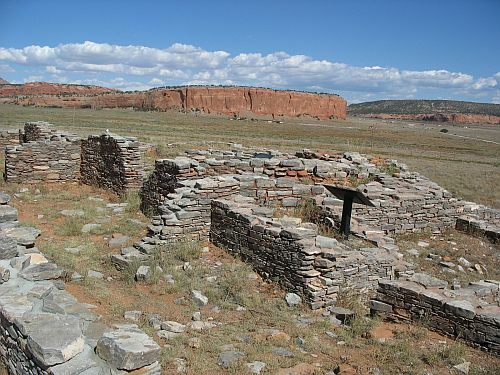 Williamson measured potential alignments to the solstices and equinoxes at Hovenweep Castle and a smaller site nearby called Unit Type House, as well as at another group of sites within the monument. These alignments generally involved small “ports” or holes in the exterior walls through which sunlight shines on or near the days in question. The beams coming through these ports tend to fall on opposite corners, suggesting that they were being used as calendars to track the progress of the sun, presumably to schedule rituals and/or agricultural activities. There is ample evidence in the modern ethnographic record that the modern Pueblo “Sun Priests” and other officials used solar observations similarly. What I want to note here, however, is that Williamson found ports with solar alignments both at Hovenweep Castle, the largest site in the Little Ruin Canyon group and plausibly either a public/ritual facility or the residence of a community leader (or both), and at Unit Type House, which in keeping with its prosaic name is a smaller site that was likely a more mundane residence. This suggests that watching the sun and keeping calendars was a practice not limited to chiefs or priests at Hovenweep, but was practiced by ordinary people as well. But why? many are the houses in Zuni with scores on their walls or ancient plates imbedded therein, while opposite, a convenient window or small port-hole lets in the light of the rising sun, which shines but two mornings in the three hundred and sixty five in the same place. Cushing implies that the reason so many people had their own calendars like this was to check the accuracy of the Sun Priest’s observations, which implies that the people didn’t necessarily trust him to get it right. So far, so good, and in keeping with the general tendency toward egalitarian ideology and mistrust of hierarchical authority for which the modern Pueblos are known. But what I find interesting is the contrast here with Chaco, where many astronomical alignments are known for the great houses and other sites that were potentially ritually important (like the “Sun Dagger” petroglyph atop Fajada Butte), but none as far as I know in the small houses where most of the population would have lived. Did the Chacoans trust their sun priests more than the later people of Hovenweep and Zuni? I think they just might have, and this brings me back to another theory I’ve proposed: that the rise of Chaco to a position of regional dominance in the tenth and eleventh centuries AD may have been associated with Chacoan elites’ control of new and ritually important astronomical practices. The astronomical alignments at Chaco appear to be the earliest known ones in at least the northern Southwest, and possibly the Southwest as a whole, and it’s possible that the development (or acquisition) of observation techniques that allowed Chaco’s leaders to demonstrate unprecedented powers of prediction fueled their rise. As long as those powers seemed to hold, they may have been able to keep close control over knowledge of their techniques, or the common people may simply have not thought to question them. But Hovenweep, with its apparently more “democratic” distribution of astronomical knowledge, dates to only slightly later than Chaco. So what happened in between? It’s hard to say, and this is one of the enduring mysteries of Chaco, but this period (roughly the middle decades of the twelfth century) does appear to have been a time of great change throughout the northern Southwest, with the ultimate result being the loss of Chaco’s regional influence, although the canyon itself wasn’t completely abandoned until the whole region was at the end of the thirteenth century. There were some major droughts that occurred during this period, which seem to coincide with some of the cultural changes, so maybe the Chacoan elites’ esoteric calendrical knowledge no longer seemed to have the control over rain and fertility that they had claimed, and people began to trust them less and to try to do their own observations too. Or maybe there was a more general spread of astronomical knowledge that undermined Chaco’s influence even if its power didn’t appear to fail. It’s very hard to tell exactly what happened, but the patterns are intriguing. Anyway, that’s my solstice/anniversary post for this year. Thanks to my long-time readers for sticking with me all these years.